Is Global News an Enabler of Divisive Balkanization? 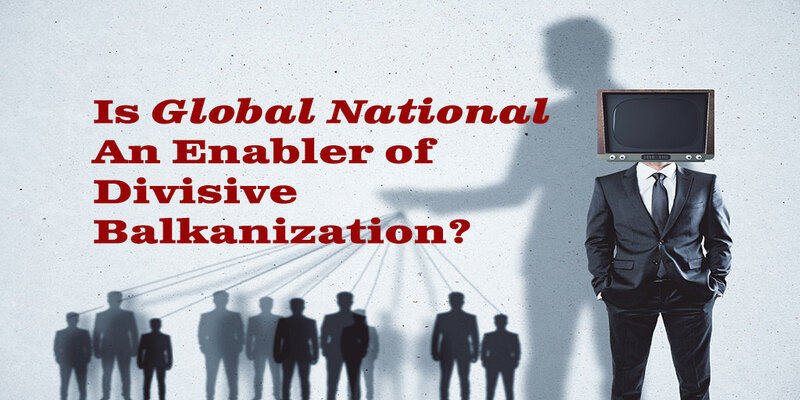 Global National: Globalist State Educator? IPSOS said in an interview last week that it advised the Liberals to provide educational information on the benefits of immigration to counter the growing sentiment of Canadians objecting to illegal border crossers. Cue Global National who days later provided a segment, not a balanced news segment, but rather an educational segment (3 segments in on the video, around the 15 minute mark) on the benefits of immigration, complete with cartoon images depicting so-called “Canadian-borns” as having low births rate, and an elderly, dying population. Didn’t the Liberals learn from Seamus O’Regan’s outrageous insult to so-called “Canadian-borns” that foreign-borns are better entrepreneurs? O’Regan’s statement has now been proven utterly false when factors such as immigration business start-up fraud is taken into account. The Global National “expert” doesn’t reveal the basis for his assertion, which is almost certainly, also false. Global News seems to have all kinds of educational segments lately. For example, on this same edition of Global National you will see an example of a recurring educational segment, this time on the types of financial advisors there are, and the pros and cons of each. They are well done, and interesting but: is that news or is that a media education program masquerading as a “news” station which one expects to be neutral? What happens if Global National wants to work some politicking into these currently seemingly benign “educational” segments? An example of just that is Global’s “People of Colour” series. This is a program that specifically excludes “Canadian-borns” and/or white people, literally, from the table. As happens with all forms of racism, people excluded from the table are bashed, as group think and tribalization define the outsider/enemy. Global News had to make a deliberate choice to call it “People of Colour” when the unifying “People of Canada” begged to be its name. Despite this divisive set-up it is interesting to hear what the invited people comprised of twenty something “people of colour” had to say about identity. They were bright, articulate, and sincere in their concerns about divisiveness, but an unexpected theme unfolded, and a superior turn. Instead, as expected in divisive politics, it took a dysfunctional turn towards group think and balkanizatoin. Some of the comments were stunningly naive in what was presented as obstacles faced by “people of colour”. It makes one wonder what the educational system is doing that these young people would feel so burdened with something that is actually a load shared by all kinds of people. For example, there was quite a lot of discussion about the experience of: talking to someone on the phone; meeting that person face to face for the first time; and, then seeing in the others’ eyes that this is not the person they had pictured on the phone. This hardly a unique experience to “people of colour.” There are all kinds of reasons for this to happen, sometimes it’s benign, sometimes it is due stereotyping, but it happens for all kinds of reasons. Some people sound more masculine, feminine, older, younger, rural, urban, educated, uneducated, etc., sounding on the phone than in person. I would bet that most adults have had this experience at least once. If so-called “Canadian-borns” had been allowed to participate, this could have been a unifying discussion. The vast majority of people asking “where are you from” are asking it to show polite interest. If the preference is to be asked, “where are your grandparents from”, okay, but why not just say so instead of creating division over it. Again and also, this is not a “people of colour” issue. People immigrating from, for example, Australia, New Zealand, and England are frequently asked (perhaps more than “people of colour) the question “where are you from?” It’s just a question to detect the origin of their accent. I have a rural, some may say “hick” accent, and am often asked “where are you from?”. I’m also often met with disbelief at my level of education with such a hick accent. If the response is: “I’m from Toronto”, and the follow up question is “no, where are you really from” it has nothing to do with the person’s colour. It’s not challenging anyone’s Canadian citizenship. It’s just a question, almost always just to make polite conversation. White people who’ve done their homework about racism and passionate about making to change… talking to other white people about racism and talking to their family members explaining why it’s not ok to say certain things or make certain assumptions. I feel like that…it’s a lot of work, right. Asking people with privilege to do that work, I feel is a better way for me to move forward. This entry was posted in "New Speak": Liberals Manipulating Through Language, Immigration, Islamic Activism, Sharia Law in Canada, Liberalism-Socialism-Communism, Mainstream Media, Think Over News and tagged balkanization, global national, global news, immigration, maxime bernier, people of colour.